The question about Life is – Was this sci-fi thriller ever destined for greatness? With a cast of actors including Jake Gyllenhaal, Ryan Reynolds and Rebecca Ferguson, all of whom I personally enjoy watching immensely, I would have thought this film was well on the way towards potential classic status. But peel back the layers and you’ll find the director Swede Daniel Espinosa has made some good, but not great, films since 2012’s Safe House. His follow up to that, Child 44 was a strange tale of a Soviet serial killer starring Tom Hardy that I caught late one night in an LA theatre and found interesting, but not amazing. 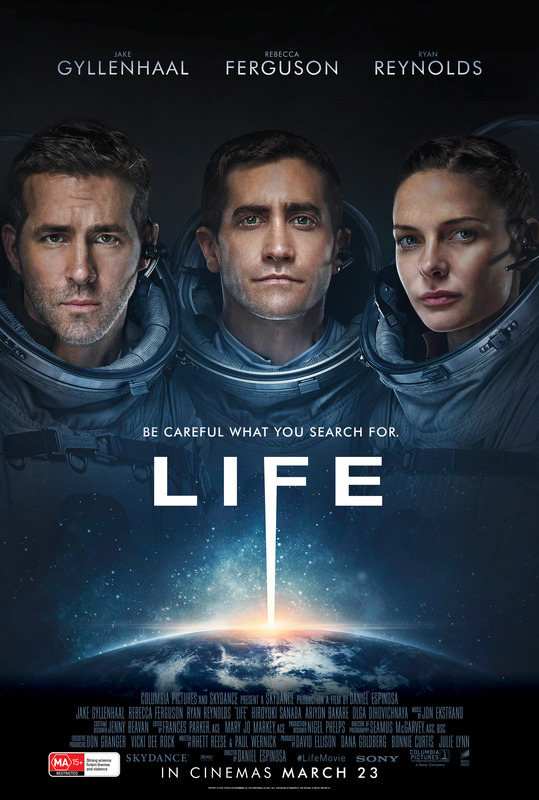 Similarly, Life begins promisingly before easing itself into resting on the familiar themes of Alien, Gravity and The Martian, a trio of what I would call “Classic” films. The 6-member crew of the International Space Station successfully retrieve a capsule from deep space that has strayed off course. Rebecca Ferguson, Jake Gyllenhaal and Director Daniel Espinosa on the set of Columbia Pictures’ LIFE. If you’ve seen the films trailer you know that the capsule contains soil from Mars, and is best possibly left floating in outer space, rather than opened up and experimented on in the ISS just above the Earth’s atmosphere. Sure enough, the Mars dirt contains “Life” and the cells start off as a cute story on the nightly news, including questions for the crew from school kids live on TV at Times Square, complete with the ubiquitous “Sony” gadget plug. It doesn’t take long for the soil sample to turn feral, and the crew are faced with battling an alien enemy in the enclosed environment of the “200 Billion Dollar” ISS. The film succeeds in keeping you on the edge of your seat as you wait for events to turn bad, but the decision making prowess of some of the world’s leading scientists and technicians when faced with this foreign adversary leave a lot to be desired. Alien works (in part) because of the military, scientific and corporate interests that divide the crew, leading to disastrous decisions as different parties follow their own agendas. Gravity was just jaw-droppingly beautiful to watch, so realistic that journalists asked Mexican director Alfonso Cuarón what it was like to film in outer space. David Jordan (Jake Gyllenhaal) in Columbia Pictures’ LIFE. The same must be said for Espinosa and his DOP Seamus McGarvey who operate at zero gravity creating a realistic sense that we are on the ISS alongside the doomed crew members. The pictures are pretty amazing, and it definitely has an authentic “In Space” feel. As usual, it is the writing that flounders, failing to lift Life into the stratosphere, ultimately making this a good, not great entry into the sci-fi thriller genre. In cinemas alongside Kong: Skull Island, which I thought was so genuinely entertaining, and coming next week, Ghost In The Shell, which looks like it could be mind-blowing, Life has every chance of suffering an ignominious death at the AU Box Office. Which is a shame because it is an entertaining, if not particularly original big screen adventure. 3 Stars. A Spooky Sci-Fi Thriller. Cant wait to see “LIFE”.